The first post I wrote as part of the God-sized dream team was on November 14th, 2012. I had no clear vision back then of what being on the team would be like or how it would affect my life. I did know from reading Holley’s blog that I appreciated her perspective, and that something in the description of what the team would be had called to me and drawn me out of my shell where I found the courage to push send on my application. Simply being chosen was awesome, and if things had stopped there, I would have been pleased. Being chosen gave me a boost of confidence and renewed hope for what God could do through me. And yet, there was more. Facebook can be a force for community and encouragement and friendship! I am eager to meet these dream-sisters in real life at Allume because of the connection we have formed in our group. Generosity is contagious. This team was formed with the larger goal of helping Holley promote her new book, which was officially released in March. To reach that goal, Holley gave us words of encouragement, the weekly writing prompts for our Tuesday link-ups, advance copies of her ebook and book, and a kind of arms-wide-open, “let me gather you up into this good thing God is doing” mentality that rubbed off on our group in big ways. With Holley’s leadership our group became a safe place for us, a place where generosity flourished. Within our group there have been guest post opportunities, giveaways, prayers requested and prayed, and a general spirit of lifting one another up as we all pursue the dreams God has put in our hearts. This team has been a place of generous love and encouragement, a place characterized by the Spirit of Christ. Words are powerful. I read blogs regularly because I love stories and people and glimpses into lives often so different from my own. The God-sized dream team has reminded me of the value of encouraging words. When I know that Mel or Kayse or Elizabeth has visited my site and left their sweet fragrance behind in their words of encouragement, it is like a friend stopping by my house for a bit, coming in, accepting my offer of something homemade, and sitting down for a quick chat. We may not be face to face, but threads of friendship and community ARE being woven together comment by comment, encouraging word by encouraging word. I have loved this part of our group. Way back in November, I wrote this: I have a specific dream to submit my writing to (in)courage or another Christian website (I need to do some more research...suggestions gladly welcomed!). I am happy to say that I have done this very thing! And this is true: without this team, I cannot imagine that I would have drummed up the confidence in myself to submit my writing to another venue. But not only have I submitted to (in)courage, I have also guest posted (thank you,Laurie! ), signed up to go to a blogging conference (Allume! Woohoo! ), and gained enough clarity and vision for my writing that I can talk about it with others who don't automatically “get it” like my dream-team sisters do. To Holley and all my dream-team sisters, thank you!! Though things may “officially” be wrapping up, I look forward to remaining connected and encouraging one another in the pursuit of our God-sized dreams. 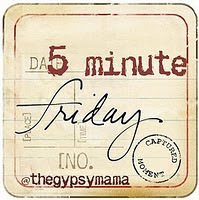 Joining Lisa-Jo and the Five Minute Friday community today. When I saw the prompt for today, View, this story from years ago popped into my mind. In the Spring, she breezed through our offices, buckets of daffodils in hand, leaving vases crammed full of cheerfulness on our desks. She was old enough to be my Mom, but had the energy and verve of a woman half her age. Sitting on her screened in porch and listening to the summer rain, she taught me to knit. Her dogs were her babies, and in my friendship with her, I glimpsed a life lived to the full. She was a master gardener, a skilled knitter, with a contagious laugh and a generous spirit. The daffodils were gathered from the thousands she planted on her property in the outskirts of Madison, WI. One day we drove out there together so she could give me a tour. Her gardens were breathtaking, looking both cultivated and perfectly natural alongside the wooded setting of her tri-level home. At the back of the house, she showed me one of her favorite things: the outdoor shower. It was a new concept for me. I stood there on the wooded deck, looking at the shower head coming out of the house wall, the loofah hanging from a hook, the shampoo bottle in the caddy…and I felt a kind of shock and awe, realizing that the woods surrounding the house were the only shower curtains to be had. I pictured that special, secluded place again months later when my friend told me that her neighbors decided to cut down the stand of trees shielding her yard from theirs. She joked that she was going to continue her habit of outdoor showering so they would wish they had never cut down those trees. At least, I think she was joking. Perhaps her neighbors were like me, desperate for a clearer view. I want to see what is on the other side of the obstacles in my path. I imagine it will be so lovely, the view beyond what I can see. Then in my mind I see one of my friends’ neighbors waking early one morning, opening the curtain to survey his lovely view, and getting more of a view than he bargained for. I laugh. And I decide that I am just fine here with my obstructed view, waiting for things to clear up at the right time. Things aren’t going as planned around here, and it makes me feel a bit tense, makes my jaw ache, makes me feel wound up tight, a string pulled taut and ready to snap. Details of life collect and push against us, like water behind a dam, and yet we do not hold the lever that will release the pressure and let everything flow. We need to make preparations for our move, because packing up the lives of five people and carting them, their pets, and their stuff across the country is complicated. Yet we are still waiting for the “official word” to move the cogs of the Navy wheels that will move the lever, open the dam and whisk us across this land of ours in an efficient and timely manner. So yesterday we sat, my husband and I, in the middle of the afternoon, trying to work it all out. We started down the “what if” road: what if this happens? What about that? Or that? Oh no, did you think of that? And then we remembered. There is Someone who sees clear down this road, whose vision goes far beyond the twists and turns and ups and downs…because He is the one making them. Our conversation began to take a different shape. Isn’t it true, we said, that the “worst case scenario” is still held in His hands, and should we find ourselves there, won’t that really be the “best case scenario”? The pressure is still heavy against me, but my shoulders are relaxing, my jaw is unclenching, and my heart is feeling lighter. I had just taken my seat, my heart still galloping away in my chest when she leaned over to me, slip of paper clenched in her hand. This is from her, she said, indicating a woman one row back who looked at me with kind, brown eyes. I took the paper, reading the words from Psalm 27, and found those eyes again with mine. Thank you, I mouthed, my eyes filling, spilling with gratitude. This morning I did a risky thing. I stood in the assembly, giving my testimony, desiring to give praise and honor to God. From early September until now, I have met weekly with a group of women to study the book of Genesis with Bible Study Fellowship. Our last meeting of the year was today. It is always a time of testimony, an opportunity to stand, take the mic, and talk about what you have learned during the study. It is by far my favorite meeting of the year. I am a story person, and I soak up the stories as they pour forth. I love the tears, the laughter, the heads nodding around the room in understanding and kindness and love. Before going into the sanctuary this morning, I gave thought to what I would say if I stood. I reviewed this past year of studying Genesis and the myriad of ways God has met me, taught me, comforted me. And a vision came, of me walking with a strong, comforting, and guiding arm around my shoulders. I saw that from Genesis 1 through Genesis 50, from the wide expanse of the starlit heavens to the darkness of the womb of a woman, I have felt the close companionship of Christ this year. So I stood this morning on shaky legs this morning and spoke about that companionship, and about the way that week after week, from Abraham to Jacob to Joseph, the theme of waiting came through to me clear and strong. When the study began in September, our family was coming up on a year of waiting for an adoption placement, waiting for the child God has prepared for our family. A whole academic year later, a whole bible study later, and we are still waiting. I shared this with the ladies this morning, told how grateful I was that week after week that God saw fit to encourage my weary waiting heart. And to remind me, through the stories in Genesis, that trusting in God and in His timing is the way to go. But the best part came after I sat down. The sweet woman two rows up shared the verse from Psalm 27 with me, wrote it down in her spidery hand, ripped it from her notebook, passed it back like we were in junior high and had secrets to tell. And then, as we all stood, hearts full to overflowing from hearing and giving our praise to God, two women found me in the back. You don’t know us, Amy, they said, but after you told your story, we had to find you, to encourage you. We’ll be praying for you, Amy. And one shared, I have my own Isaac I prayed for, for four years I prayed, and he came at the exact right time. And the other said, Amy, I have 12 children, 9 of whom are adopted. And I prayed and waited for each one. We know your pain. We know and we will pray for you and hold you up, sister. Walking to my car with the slow and steady gait of one in awe, I wondered, what if I hadn’t stood up? I wouldn’t have my note, those words of truth tucked safely into the pocket of my skirt. And I wouldn’t have the memory of the hugs, the testimonies and prayers and love from those women at the end. Where my dream is concerned, the riskiest thing for me is believing I have a story to tell, and then standing to my feet to tell it. It is my hope and prayer, that my writing be a testimony like the one I gave today, of the companionship of Christ. Not just in salvation and in fellowship, and in provision and goodness, but in waiting and in trial and in grief and loss and death. I stood in the assembly this morning, and I gave testimony, and even as I sought to give Him glory, He met me there, and gave me good gifts, and grace. 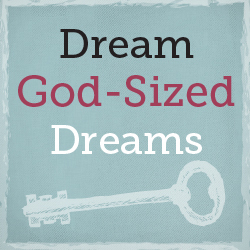 What feels risky about the dream God has put in your heart? Linking up with Holley and my God-sized Dream Team sisters! My heart is singing this morning! There was time, and there was quiet, and there was Five Minute Fridays, and I wrote. Thank you, Lisa-Jo, for the prompt that helped me focus down, for giving my detail-crazy brain this joyous break to write freely. On Fridays, we write, for five minutes, and we don't worry if it is right or not. Such fun! Join us? I clearly remember standing in front of the table at the end of the hall, barely as tall as the table itself, gripping an 8-track tape of Captain and Tennille in my little hands and shoving it into the player, waiting for the first strains of Muskrat Love to come out of the speakers. During the years when my stepfather lived with us, in the little house on Oxford St, the soundtrack of life then was country music, not the new pop-Country stuff, the old-fashioned down on your luck, whiskey-drinking, broken-hearted stuff. Recently, while my feet pedaled furiously on the spin bike at the gym, an AC/DC song came on. Instantly I was transported right back to the dark high school gymnasium, the smoke from the fog machine whirling around, the dancing bodies of my classmates around me, the screechy voice of the lead singer ringing in my head. I hear the song Breath of Heaven by Amy Grant and it always reminds me of the year our church put on the Living Christmas Tree, and I stood in my place as part of the choir high up in the huge tree, hearing the soloist’s pure, breathy voice sing about Mary and her journey to Bethlehem and the birth of Jesus. I wonder what songs I will hear, years from now, that will bring me back to this time? Maybe the Elton John songs my son downloaded to iTunes? The Josh Garrells music we all love so much? Mumford and Sons? Will I remember rocking out to You Can Call Me Al by Paul Simon during a wicked game of Sorry with the kids? Or the first time I played Farther Along for my husband, eyes full of tears at the beautiful truths contained there? What songs are you listening to today? What memories do they stir for you? Fridays, I look forward to joining in with the community over at Lisa-Jo's place, where "a brave and beautiful bunch gather every week to find out what comes out when we all spend five minutes writing on the same topic and then sharing 'em over here." Join us? You are invited to add your words to the mix! When I saw the prompt for today my mind went immediately to our camping trip last summer where my children showed me, one day on the river, what brave looks like. Here goes my five minutes on: Brave. The water froze our ankles as we made our way up the slippery riverbed, toes gripping mossy rocks. Up ahead, the water widened out, formed a pool ringed round by large boulders. With the kids trailing, making their own way along the rivers edge, I explored the pool, finding that yes, the kids could safely jump from the biggest boulder into the breath stealing cold of the river. Should they be so inclined. So brave. The youngest made her way up the boulder, brother waiting strong and steady in the water, arms spread wide. With her jump, she flew as though diving, splashed loud and happy into the water. The second born, finding courage from watching siblings’ bravery, made her own way up the boulder. Hesitating, waiting, she finally left the firm surface of the boulder, flinging herself toward river and brother and sister. Brave, sure and strong now, having conquered the fear of that first time, they became an assembly line of jumpers, laughing, splashing, winging their way from boulder to cold river again and again. These pictures encouraged me this morning. As our family prepares for this new adventure, I see all of us on the boulder, encouraging one another: we can do this, we are brave, we are together. Soon, very soon, we will gather our courage like a woman gathering her skirts, and we will jump.